Visitors preferring a less detailed guide to the illustrations on this website may wish to consult the Summary of Photographs page. The most recent records remain in the custody of the choir secretary or librarian. The older surviving records have now been transferred to the Cumbria Archive Centre at Barrow, where they may be inspected during normal office hours. The minute book states in April 1933 that the new secretary reported receiving "certain information" from the late secretary, but that it was incomplete. A minute made in October 1935 confirmed that the choir was inaugurated in July 1931. ►box file of minutes 2005-2009 with associated correspondence. Attendance registers 1966-1987 (including lists of members and addresses); 1988-2008; 2009-date. 1969-1988 (includes details of concerts given, festivals attended and pieces performed). - Morecambe Musical Competition Festival: adjudication sheet (unsigned) for "Hark, Jolly Shepherds" (Thomas Morley); "Zut, zut" (Elgar) and "Down among the Dead Men" (Vaughan Williams), 6 May 1933. - Millom Musical Festival: adjudication sheet signed by Geoffrey Shaw (rough notes, pieces not stated), "1933"
- Workington Musical Festival: adjudication sheet signed by E Markham Lee for "After Many a Dusty Mile" (Elgar) and "Seamates Bold" (Ernest Markham Lee), "1933". - Preston Festival of Music & Drama: 1st prize certificate, Feb 1950; also a further 1st prize certificate from Preston, undated. - Blackpool Musical Festival 3rd prize certificate in class 100, 1967; also a festival programme (incomplete). Winter Gardens, 23-28 Oct 1967. - Adjudication sheet, Blackpool Musical Festival, undated, signed by Jean Allister, c1960s. 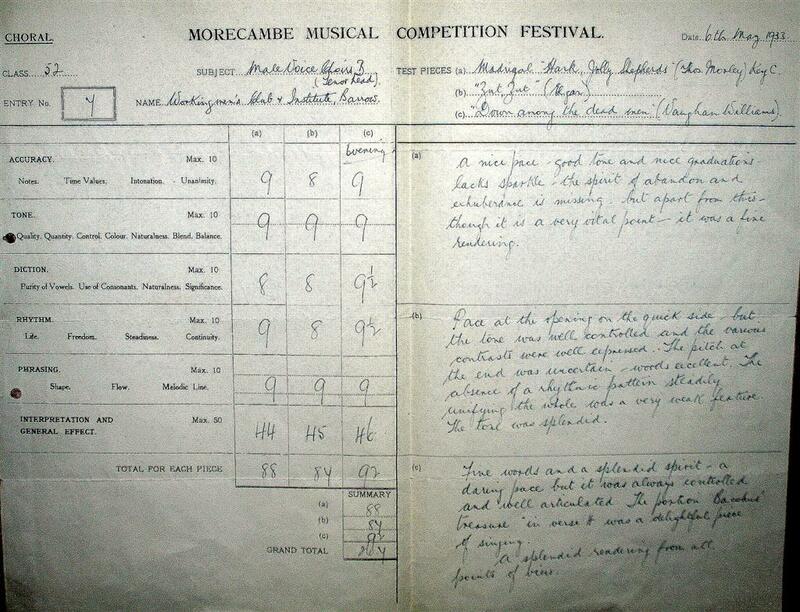 - Adjudication sheet, ?Morecambe Musical Festival, no venue and undated, c1960s-70s. - Morecambe Musical Festival 2nd Place certificate with adjudication sheet and associated correspondence attached, 2-14 Apr 1973. - Freckleton Music Festival 3rd prize certificate, 29 Nov - 8 Dec 1979. Adjudication sheet (undated) attached. - South Cumbria Musical Festival 1st prize certificate, undated [?- ?-- and Wallace Berry, adjudicators]; also a further 1st prize certificate dated 3 April 1982. - Postcard: choir in practice room, annotated "C Dearden, 1932"
- Choir (mostly wearing bow ties and evening dress) outside Working Men's InstituteWorking Men's Institute with 2 trophies and 1 shield (early view; 5 copies, one being annotated "J C Dearden, 1935-36". - Choir (mostly wearing neckties) outside Working Men's Institute, with conductor H H Thomas [centre front] and 3 trophies (2 copies, variously dated "mid-1930s" and "JCD, Oct 1948"). - Choir (mostly wearing bow ties and evening dress) outside Working Men's Institute with 2 shields, early view, no date, c1930s. - 3 views of choir alongside Albert Memorial in London attending Festival of Britain concert (one loose, one mounted on card beneath photo of "James Hughes, 1959" and one small snapshot), 1951. - Choir indoors in front of bookcase; Gilbert Uren holding baton behind two trophies (2 copies, one dated 1950 bearing Barrow News & Mail stamp), c1950. - Choir just after Coming-of-Age concert outside Public Hall with conductor Gilbert Uren [centre front] (2 copies), c1952. - Photo: Henry Webb, William Crawford, John Heddle Nash (guest in 1959, 1962, 1968 & 1970) & Gilbert Uren, 2 copies, c1960. - Photo: Gilbert Uren, Harry Hall, Jack Byfield, Owen Brannigan and his friend Henry Webb (2 copies), Annual Concert 1961. - Photo: J Noble (piano), J Lawrenson, J Honeyman, W Jacobs, 1966. - Choir under Reg Lanworn [front, fifth from left] at rehearsal preparing for "Grand Sing" competition on BBC TV and Golden Jubilee concert in Civic Hall, (2 copies) c1980. - Choir (mostly wearing new light blue shirts) ready for television appearance on "A Grand Sing" under conductor Reg Lanworn, 1980. - Colour snapshot: choir with maroon blazers in room with hospital signs behind; conductor Mike Petty, c1994. - Colour snapshot (dark): choir with maroon blazers attending a performance, with several older ladies sitting in front row, conductor Mike Petty in white jacket, c1995. - Folder containing four photographs of groups or individuals currently unidentified, various dates. Bundle of programmes from Annual Concerts 1952-1953, 1955-1986 inclusive, 1992-2006 inclusive, 2008-2009. 13 Dec 1960, 11 Dec 1962, 14 Dec 1964, 20 Dec 1966, 17 Dec 1968, 14 Dec 1970, 11-12 Dec 1972, 17 Dec 1974. - Programme: Celebrity Concert in Barrow Public Hall (the choir alongside Thomas Round, tenor, and Tony Drummond, violin), 15 Oct 1967. - Typed report and ticket for centenary concert (Brass & Voice Concert) of Askam Town Silver Band, in association with Barrow Male Voice Choir, in the Band Hall, Sandy Lane, Askam, 28 Feb 1989. - Programme: with Barrow Working Men's Choir and Lon Dhoo Choir (Isle of Man) held in Forum 28 (Civic Hall), Barrow, 13 Oct 1990. - Programme: Rotary Club Evening of Music and Song Extravaganza (choir with Sir Richard Arkwright Masson Mill Band, Matlock [formerly Thornton's Band]), St Matthew's Church, Barrow, 16 May 2009. Programme: Barrow Male Voice Choir Annual Concert, Lisdoonie Hotel, Barrow, 27 Oct 2009. - Celebrity Concert for Cancer Research Fund with Owen Brannigan, William H Evans (cellist), Millom Mixed Choir and Millom Male Voice Choir (conductor Frank G Crayston), Alexandra Hall [Millom], 11 Sep 1960. - Furness Mystery Plays, Furness Abbey, produced by Philip Bromley and introduced by Norman Nicholson, 3-15 July 1961. - Concert with Joan Hammond, soprano, accompanied by Ivor Newton, Public Hall, Barrow, 12 Nov 1961. - Booking leaflet for Furness Abbey Mystery Plays (including an introduction by Norman Nicholson), 27 June - 8 July [?1966]. Kenneth Bowen (1972); Jack Byfield (196? ); John Cameron (2 items & 1 duplicate 1960); Brian Rayner Cook (3 items, 1972-74); Bernard Dickerson (2 copies, 1968); Carl Duggan; Erica Harrison (2 copies, 1962); Raymond Herincz (1964); John Holmes; Richard Jackson (1975); John Lawrenson (?2 items); Soo Bee Lee (2 copies, 1977); Susan Mason (1979); Noel Noble (1972); John Heddle Nash (2 items plus smaller duplicate, 1959, 1962, 1968, 1976); John Ogden; Stanislav Pieczora (2 items, 1957); Thomas Round (2 items plus smaller duplicate and one negative 'with All Good Wishes To "The Choir" from an Ex-Member'); Barbara Robotham (1968, 1970); Kathleen Uren (2 copies) ; Joseph Ward (2 copies, 1962). Angela Caldwell & John Michigan (with members, 1964); Jim Noble, Kathleen Harrison & Raymond Herincz (1964). 2 unidentified negatives: "Anne" and ? ? - Music for 'Drinking Song' ['Back and side go bare'] from the cantata 'In Windsor Forest' by R Vaughan Williams. Oxford University Press, no date. - Sheet with printed coloured strips attached containing music-related mottos and quotations from classical authors, undated. - Publicity leaflet: Hampton Court Palace, undated, c1960s. - Pencil notes for pieces to be performed "at Askham", no date. - Typed copies (3) of Short History of the choir (as used on original website), undated, c1960s-70s; (one copy includes a list of placings in various festival competitions 1931-1960). Small amounts of other material relating to local male voice choirs may be found online in the catalogues of the Cumbria Archive Service.